Former Defense Minister says aims of 'March of Return' are to destroy the Jewish State, IDF responding responsibly. 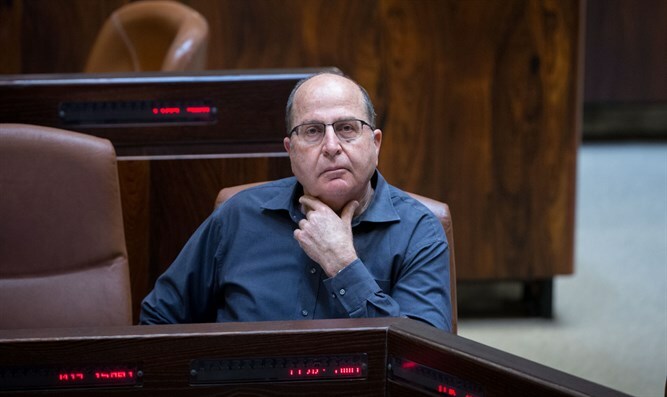 Former Defense Minister and former IDF Chief of Staff Moshe Ya'alon spoke to Arutz Sheva about a series of events on Israel's agenda, from the events of the fence in the Gaza Strip to dealing with kite terrorism, the Iranian arena and even his personal political path. Ya'alon was asked to relate to the IDF's handling of the fence's fugitives, saying that the IDF's conduct was "undoubtedly correct, and that the Gaza story is a threat to the very existence of the State of Israel." "When Hamas comes to the conclusion that its strategy is to send young people and others to sacrifice for its propaganda purposes, it is good that the IDF is preventing this, and that it is trying to do it through non-lethal means. But when there is a danger of explosive charges or a breach of the fence, they fire to hurt." As for the potentially damaging public relations aspect of the deadly riots, Ya'alon said: "Now it's a diplomatic campaign. In the past many countries did not understand us and claimed that it was all because of us. It's ridiculous. Of course there are interests here and it is not about romance or justice. The United States is with us, and even the UN Secretary-General's statement was not one-sided. We must continue to explain ourselves, but with the knowledge that there are those who will never be persuaded, such as Erdogan and South Africa." When asked if he believes that Israel should have made different preparations for the opening of the US embassy in Jerusalem and the 'March of the Return' riots in Gaza, Ya'alon replied: "As an observer, I see that we are doing a good job, both informative and on the ground. Our interest is that there should not be dozens of casualties. Rather, that is in Hamas' interests. It is clear that this is not a demonstration and that the issue is the 'return.' We are not in Gaza, so where is the 'return' to? To Tel Aviv? The army is well prepared, and we must prepare for the waves that are expected in the coming days." As for the new phenomenon of kite terror, Ya'alon said that "operationally, we have to find a solution. We must not underestimate this terror and the damage it causes to agriculture, and I see that they are trying to find solutions. There is basic misunderstanding between them and us. We are fighting because their unwillingness to recognize our existence on any borders, and not over a Palestinian state. The proof is the exit from Gaza. They do not thrive (as a result of our giving them Gaza). They fight us because the war is over Tel Aviv and not Gush Katif."